Blood Glucose Meters, Strips, and Sticking it to Yourself Daily | 5-6-7-8 Dancing My Way to a Healthy Me! ← Justice Arrives Like a Thunderbolt! A computer widget thing-a-ma-bob called a “Blood Glucose Meter” that ranges in size from an Oreo cookie to the size of a deck of cards. This widget is a specialized electronic testing device to measure the amount of sugar floating around in your blood. You need disposable needle thingies that you stick yourself with to draw blood. They are called “lancets.” I thought I’d try to use steak knives and save some money but my doctor gave me one of those “Mom Looks” which they hand out to doctors at the same time they get their Medical Degree. So I quickly and wisely decided that I’d get the lancets and nix the whole cutting myself with knives thing. You need these disposable strips onto which you smear your blood. Then you stick one end of the strip into the machine and a few seconds to a couple minutes later (depending on the machine) you get a number pop up on the screen on the front. That’s your blood glucose number. Thank Heaven for President Obama and his allies who pushed through the Patient Protection and Affordable Care Act. If not for that bill, I’d be uninsured and my goose would be basically cooked. At present, my only option is to obtain insurance is through the ACA. Without it I literally would not even know I have diabetes, let alone have the money to treat it. BEFORE (written Wed night) — If there is any justice in the world, pun deliberately selected, then the Supreme Court will hand down a decision that allows me to continue getting subsidies that allow me to be able to have insurance. Heaven help anyone without insurance who is diabetic. Check with your insurance company. My company, Blue Cross Blue Shield of Texas, covers the cost of the meter at 100% including free Two-day Shipping to my home. Yay! The true “expense” in using the meter is not the meter itself however. It is in the monthly supply of testing strips that you have to buy for use with the meter. So, when I found out I needed a widget like this, I did what any red-blooded-former-librarian would do I went to Consumer Reports to see what they said in their review of the devices. More about test strips in a moment, but if you look at the Annual strip cost in the column below you’ll see where these companies really make their money. And you’ll see that for a person like me who lives on a small pension and a few odd jobs to supplement that, there is NO WAY I’d be able to afford those kind of costs. Which made the choice of machines obvious: Either get the Up & Up from Target or the ReliOn from Walmart. So… I check costs, about the same. When I checked last week (around June 15, 2015) the Up & Up was $14.99 on the Target Website. The Walmart Relion Micro was $14.98. For those without a store nearby, shipping and handling is extra. So.. I check store locations: Walmart by far has more stores than Target. Which means getting the strips would be easier. However both Walmart and Target have locations near where I live now and where I’ll probably be living a year from now. And since, according to consumer reports the test strips are pretty much the same cost on an annual basis it seemed almost a toss of the coin as to which one to get. I decided to get the Up & Up from Target. Because I like Target better than Walmart as a store to shop in. And because red is my favorite color. And because the rating for the Up & Up is slightly better according to CR than the Relion. I logged into the customer area of the Blue Cross Blue Shield website and emailed the company for information about Blood Glucose Meters and Testing Strips asking about what BCBS covers. Those are two different version of basically the same device. 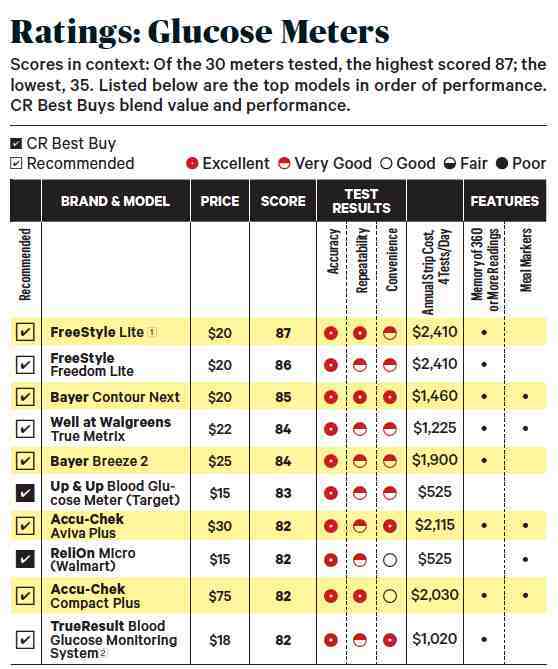 The Contour Next is number 3 on the Consumer Reports chart and the only one with “Excellent” in the Accuracy, Repeatability, and Convience categories! Woo Hoo! I called on the 23rd. The very nice lady on the phone said that it would be shipped two-day via UPS so I should get it on the 25th or the 26th. Woot! Honestly I was shocked by how easy it all was. Based on my past experience with Blue Cross Blue Shield I was ready for a fight and prepared to go nuclear on them and report them to the Texas Dept of Insurance if I had ANY issues AT ALL. I’ve filed a formal complaint on them before and I’m prepared to do it again at the slightest hint that they are not honoring their commitments. But I’ll save all that drama for another day and another post because this post is already too long. Anyway, everything went off with no issues. BCBS responded within 36 hours to my request for information. I called the 800# and only had to wait 10 minutes to speak with someone. She took my address, name etc and boom. I was done. In my case it worked out, but I was prepared for trouble. Which brings me to the lancets. Logically lancets are the next bit you need to think about, because without the lancet there is no blood to put on the test strips. If you have a blood fetish and giant posters of sparkly vampires and Buffy adorn the walls of your house then you might get into the idea of drawing a little bit of blood every single day, one, two or even 3-5 times a day, depending on what your doctor tells you. I’m sure I’ll get used to it but for now I’m not looking forward to it. What I’ve discovered is that there are two kinds of lancets. (1) A fancy pen like thing kinda like a utility knife that you buy at Lowe’s only thinner, smaller and in pretty pastel colors But the principle is the same. You have a holder and you put a disposable needle/blade into the “holder” and there is (2) a completely disposable widget – use it once and throw it away. There are several dozen different brands of lancets and more models of lancet holders than there are models of cars. Let your insurance be your guide. Get whichever one they will pay for. My insurance has several brands that it will pay partially – I end up paying a copay of $10 per month for the lancets. Since I’m getting the Bayer Contour, I figured I’d make all the bits match so I’m getting the Bayer Microlet lancets. These lancets are tiny cartridges which click into the Lancet holder. A hundred comes in each box which depending on your testing schedule means it will last 1-2, perhaps 2 1/2 months. Bottom line: you have to do your homework to get the lowest cost. Read your policy manual carefully. Again, thank heaven for the ACA aka “Obamacare” without it I’m up a creek with no lancets. The Testing Strips / How often should you test? They have to match your testing device. So, since I’m getting the Bayer Contour Next, that means I have to have the Bayer Contour System Testing Strips. To get the insurance to cover it, I had to have my doctor write a prescription, just like a drug and send it to Walgreens. How often you need to test depends. Ask your doctor. I have an appointment with my Doctor on July 7th and I’l talk to her then about it. Until then I’m going to take the advice of the Pharmacist at Walgreens. Yes, the actual pharmacist, not the very nice clerks who ring up things. The trained professional person. She said that I should (1) Test as soon as I wake up in the morning, before eating or drinking anything and before taking my meds. Then after eating breakfast and taking all my meds, (2) I should take a second test about 2 hours later. She said it is important to be consistent in when the second test is done. My doctor wants me to record everything and show her the numbers when I see her each month. The Insurance and their love of fine print. Ok, here’s the deal. My doctor wrote my prescription for the test strips for me to test two times per day. 100 per box / 2 per day = 50 days. Which is 10 days short of two months. But because it is greater than a 30 day supply my insurance is insisting that I pay $20 in copay because they view a 100 count box as a two month supply and my insurance will only cover a 30 day supply at the $10 copay level. BUT… the 100 count box is as small a box as they sell! So, I’m faced with a choice, either ask my doctor to tell me to test 3 times a day (and write a prescription to match) or just accept that I’m going to be paying for two months but not getting enough lancets and strips to last for two months! Especially since I’m new at this and I end up messing up both lancets and test strips. Yesterday, the vampire that is disquising as a blood testing meter kept beeping for “more blood” because I was messing it up. I went through FIVE strips and three jabbed fingers before I finally got a good reading. Hey it is a skill like any other skill. It will take me time to get it right. This morning I was able to do it in a single try! Woot! So, take a deep breath and do your homework. You may have to work with your pharmacy, your doctor, and your insurance company to get things set up so that you can do the testing on your budget. After talking to the benefits department at BCBS, and translating their legalese into normal human communication, I thought, “I’ll call Walgreens” and talk to the pharmacist and see if there is anything they can do on their end.” I don’t know exactly what she did to the Rx but when we were finished speaking on the phone, my first box of strips will now cost me $10 not $20. And frankly I have no issue with that. It will give a better data set for her to determine if the drugs are working or not. And if it turns out that I only need to do 2 times a day at some point, well it isn’t like I plan on stockpiling these strips. I will only re-order the Rx when I’m getting close to needing more. If that works out to be every 30 days or every 50 days then it doesn’t matter to me. What matters is that I’m paying $10 not $20. My prescription for the lancets has not yet been sent over by my doctor. I think that there will be no problem with that one however because, according to Blue Cross Blue Shield, the negotiated price on the lancets is 9.88 which means that since my copay is $10, then I’ll pay full retail for the lancets. Not sure how or why that is the case and I won’t believe it until I’m standing at the Walgreens counter with the Rx in my hot little hands, but hey, if that’s how it turns out then awesome. Check on YouTube for videos about the device you use. I hope that sharing my own learning experiences with all you guys has been entertaining and helpful. Fell free to comment, share etc. Posted on Sat, Jun 27, 2015, in Living with Diabetes and tagged ACA, Affordable Care Act, bayer, bayer contour, blue cross blue shield, blue cross blue shield of texas, contour, diabetes, diabetic, gay marriage, glucose meter, glucose test strips, healhtcare, Health, how to test your blood sugar, lancets, Patient Protection and Affordable Care Act, scotus, supreme court decision on ACA, Supreme Court Decision on gay marriage, type 2 diabetes. Bookmark the permalink. Leave a comment.